After contemplating and researching the television, I had come to the conclusion that it would be imperative to design a device that would replace other devices of its sort, just as Apple had done with the iPhone. I thought about how my daily routine goes and how the system of media plays a role. I am able to recognize certain patterns in my behavior that suggest that I am drawn more closely to the devices and services being sold to me, that benefit me in the most broad variety of ways, such as using Roku because I can use Netflix, Hulu and Youtube verses using the Playstation because it allows for game play, Netflix, Spotify and Youtube, I would chose the Playstation. My objective is to take the ordinary TV and transform it into an independent device/service. There should be no need for a Roku, Playstation, Apple Tv or even cable, the STEEZy TV can do it all for you! The STEEZy TV will have many captivating and commodifiable features, such as a camera for face recognition and a access to your virtual closet. Steezy will have the ability to capture your photo and take apart your outfit piece by piece. You can tell steezy what clothes are dirty and clean so that it can take into account the weather and your schedule in order to offer outfit suggestions which will save time getting ready in the morning. Steezy also includes, a microphone to respond to commands like “Steezy, play Thotiana by Blueface Bleedem” or “Steezy, play my wake-up melody”, or “Steezy, what’s the weather today?. With the Steezy Tv you can set reminders, plan outfits, and have access to all of your most important media accounts. The system of media consists of many aspects outside of myself and my television, there are channels, services, cable companies, device brands, and physical media such as shows, music and soundscapes. The consumers; people like me who use media daily will be immensely and positively affected by my product, it will allow the consumer to use minimal effort to access all of their forms of media quickly while also being able to access utilities like alarms, weather, news, podcasts and more. This device will improve the system for people like me because not only will it save time, but space and time as well. With this device, on a day to day basis, I will be able to wake up and without use of a remote or moving from my bed, I will be woken up by an alarm, and would proceed to be able to play my wake up playlist or ask my tv to play me the new episode of my favorite show that I missed. I could scroll down my instagram feed and read the news before I even get up to brush my teeth. I could be running out of the door and ask my tv to send that one email I never had time to send. All of these small things add up and start to take the form of one brand new, time effective lifestyle. 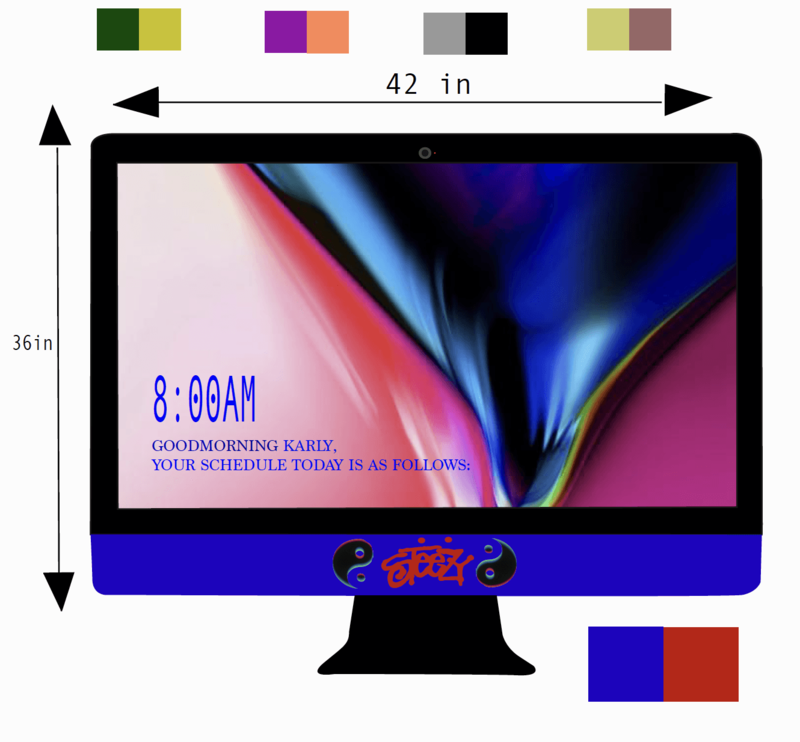 The STEEZy TV will be made of the same materials a normal television would be made of, but the key difference here is that the TV will be modeled like a larger Mac Desktop, in that it will sit on its own sleek stand making it portable and lightweight. It is important that the device has a nice presentation with its features in order for it to be commodifiable. The STEEZy TV will be available in many different colorways, those all consisting of two tones to match its surrounding. The colorway depicted below is Red & Blue, the theme of my room being why I chose it. The intended effect of my device is to further improve the quality of media intake and output, along with the ability to save time, money and space.